These personalized names are hand cut from Walnut for Christmas Stockings or can be hung on a wall. The size can be adjusted for the size and space. The name may be in print or cursive, you pick the font. You may also select the wood. The strength of the wood is important depending on how it will be used and the font picked. Some woods have a stonger grain that will support delicate lettering and/or not break as easily. Tom designs the name for the space. If you want to have the circle around the letters it helps support and give strength to the letters. The design of the letters can be larger and or thicker, rather than small for a stocking. 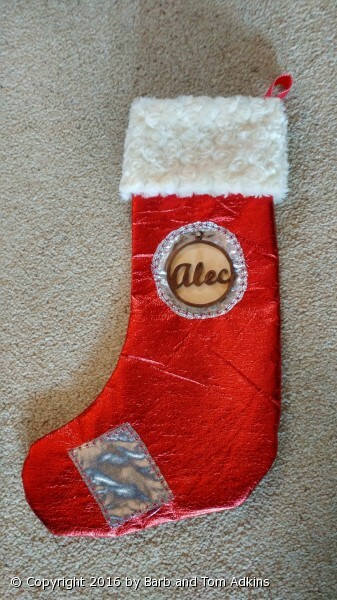 The stocking letters are quite small so the name and circle made from the same piece of wood ads strength. Then top cuts a different piece for the background that will also provide even more strength. Each piece is sanded with a finish added to bring out the beauty of the wood.